Placing an image from Elvis onto a layout in InDesign with Smart Connection installed is one of the ways of adding files from Elvis to the Enterprise workflow. In addition, the image also needs to be made part of a Dossier. This article describes these actions in more detail. For details about how to control which action takes place, see Controlling the actions of placing Elvis 6 files in InDesign with Smart Connection installed. Note: In this scenario, the option to automatically add an Elvis image to Enterprise is enabled. Step 1. Place an Elvis image onto an InDesign layout that is stored in Enterprise. The image is automatically added to Enterprise. Next, the image should typically also be made part of a Dossier. Smart Connection tries to do this automatically (see Rules for adding an image to a Dossier). When this is achieved, the process of adding an image is now completed. When the image cannot be automatically added to a Dossier, a window appears to choose the Dossier from. A default Dossier is automatically selected. Step 2. From the list, choose a Dossier to which the image should be added and click OK. Step 1. 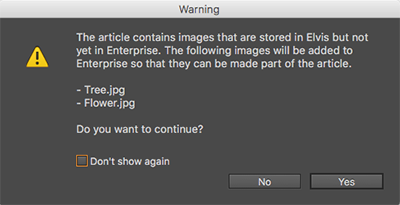 Open an InDesign layout that is stored in Enterprise and that already contains a placed Elvis image. Step 2. Add some text frames or check out an existing article. Step 3. Select all frames of the article together with the frame holding the image and choose Smart Connection > Check In Article... or Smart Connection > Create Article... . The image is added to Enterprise. Note: When clicking No, the process is canceled and the article is not created; it is not possible to create an Enterprise article containing Elvis images. The Check In Article or Create Article dialog box appears. Step 5. Make any changes, including choosing a Dossier to add the article and image to. Note: In this scenario, the option to automatically add an Elvis image to Enterprise is disabled. Step 1. Drag the image from Elvis onto an InDesign layout that is stored in Enterprise. Step 2. Select the image and choose Smart Connection > Create Image. Step 3. From the list, choose a Dossier to which the image should be added and click OK. Step 1. In InDesign, check out a placed article on a layout or create text frames to turn into a new article. Step 2. Drag an image from Elvis onto the layout. When adding an Elvis image to Enterprise, Smart Connection tries to automatically add the image to an existing Dossier. When the image is part of an article and the article is added to one Dossier, that Dossier is used. When the image is part of an InDesign article and the InDesign article itself is not added to a Dossier but another component of the InDesign article is added to one Dossier, that Dossier is used. When the layout is added to one Dossier, that Dossier is used. Note: The process stops as soon as one or more Dossiers are found for a Rule. Only when no Dossiers are found for a rule is the next rule tried. When Smart Connection encounters more than one Dossier to which the article could be placed, a window appears in which the Dossier to add the image to should be manually chosen. One of the found Dossiers will be preselected. 27 December 2018: Renamed from 'Adding Elvis 6 images to Enterprise 10'.